In its effort to dominate the world with all things Doctor Who Auntie Beeb has released another reasonably priced box set, this time themed around the three Silurian stories. Doctor Who and the Silurians, is a Jon Pertwee (third Doctor) seven-part story which originally aired between January and March 1970. The Silurians was the second story of season seven. The Doctor and Liz Shaw are summoned, by the Brigadier, to a new facility at Wenley Moor. The facility is a new type of power station, but oddly enough there appears to be something wrong with the staff. Investigating nearby caves the Doctor discovers the Silurian race that has been in hibernation for millions of years and now wants their planet back from the uppity ape decedents. To aid them in their plans to take over the Earth, they release a deadly virus. The story has been split across two discs with episodes one to four on disc one and the remaining three episodes placed on disc two. Although there is much to commend in the story its length is not one of them. This means that the middling episodes seem unnaturally elongated. By now Jon Pertwee had settled into his dashing portrayal of the Doctor and is clearly having fun. Look out for Fulton Mackay (Dr Quinn), who would find lasting fame in Porridge, and Geoffrey Palmer as Masters. If you look really close you can also spot Paul Darrow as Captain Hawkins who would make another return to Who before going off and finding fame as Avon in Blakes 7. The picture quality is a little soft, but considering that it is produced by combining an American colour print with a superior black and white print, it’s amazing just how good it does look. The fake caves do a good job except for the, occasional, obvious sound of crunching polystyrene as actors walk around. Generally the production value on the show are high, meaning it was made before the Beeb decided to try and do a prime time show on a shoe string. Extras, which have also been split across the two discs, are well worth a look. Disc one give you What Lies Beneath (35 min 12 sec) is a little different from most extras as it attempts to place Doctor Who in a sociopolitical context. You also get a commentary with Barry Letts (producer), Terrance Dicks (script editor) Peter Miles (Dr Lawrence), Tim Combe (director) and Caroline John (Liz Shaw). It always amazes me the high regard in which the show is obvious held, by the people that have worked on it, for them not only to want to return to talk about the show but also the amount that they can recall. There's also the option to listen to the isolated music track and, as per usual for these Who releases, there's a text option included where pertinent information pops up as the show progresses. The extras continue on disc two with the commentary, isolated music and info text; on top of that you get Going Underground (19 min 10 sec) with Barry Newbery (designer), Tim Combe (director) and Barry Letts (producer) discussing the problems of shooting characters in caves; Now and Then (9 min 41 Sec), narrated by the brilliantly languid Geoffrey Palmer comparing and contrasting how the sets looked back then and how they look now for the new series; Musical Scales (13 min 55 sec) looks at the experimental use of music in the show; Colour Silurian Overlay (4 min 45 sec) is a quick look at the restoration work by the magnificent Doctor Who Restoration Team, heroes to all Who fans; Photo Gallery; a trailer for the forthcoming The Time Meddler; and some PDF Radio Times listings. 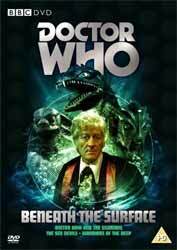 The Sea Devils, is six-part Jon Pertwee story which originally aired between February and April 1972. The Sea Devils was the third story of season nine. On their way to visit the Master, who is in prison, the Doctor and Jo Grant start to realise that there is something very wrong, not only with the Master’s captivity but also on a sea fort, whose only two custodians are attacked and one of them killed. Fighting his way through a disbelieving military, and the nefarious machinations of the Master, the Doctor realises that another branch of the Silurians has awoken from their slumber, but will he have any more luck in brokering a peace between the Silurians and the human race? This was the era of the Master played with great panache by Roger Delgardo. It was well known that Pertwee wanted to inject the sort of excitement that could be found in James Bond films and so he must have had a field day with this story, as it must surely contain the most number of differing vehicles for him to ride around in. One of the nice things about the Sea Devils is that the little suckers can run, skulk and generally act in a dynamic way missing from many of the Who monsters. Once again the disc has a good selection of extras you get the isolated music and an audio commentary with Barry Letts (producer), Terrence Dicks (script editor) and Michael Bryant (director); Hello Sailor (36 min 41 sec) another documentary about the genesis of The Sea Devils and the role the navy played in helping to make the program; 8 mm (3 min 54 sec) some silent home movie footage made during the making of the show, which comes with a commentary; Continuity Announcements; Photo Gallery, the same trailer for The Time Meddler; the Radio Times listings; and the Piccolo book - The Making of Doctor Who. Warriors of the Deep sees Peter Davison, as the fifth Doctor, star in a four-part story which originally aired in January 1984. Warriors of the Deep was the first story of season twenty-one. On their way to show Tegan some of her future history, the TARDIS is attacked and has to make an emergency landing in an undersea military base. Tensions are running high at the base with endless drills for a possible nuclear confrontation. Within the base spies are attempting sabotage but worse still, from the murky depths of the sea, the Silurians have returned with their own agenda for mankind. I have to admit here that Peter Davison was my favourite Doctor and proof that he could regenerate into a younger man and still be believable. Of the three stories this is the tighter one benefiting from a shorter number of episodes. Unfortunately what could have been a good story is transformed into a travesty by the appalling production value - I don’t even want to talk about the Myrka - something which is admitted by everyone involved. This is not the fault of the crew and actors but rather the Beeb’s poor treatment of what, at that time, was one of their most successful shows. Another batch of enjoyable and interesting extras peppers this disc. The commentary, this time is provided by Peter Davison (the Doctor), Eric Saward (script editor), Janet Fielding (Tegan) and Matt Irving (special effects); isolated music track; info text; The Depths (31 min 45 sec) is a documentary about the making of the show which is extremely honest about the short comings of the story; They Came From Beneath the Sea (12 min 57 sec) which focuses on the creatures in the show; Science in Action (6 min) looks to be an educational show - which takes a quick look at the use of polymers in the show's special effects - with Matt Irving; Continuity Announcements; Photo Gallery; The Time Meddler trailer and the PDF Radio Times listings. Placing the shows together highlights both their strengths and their weaknesses. On the plus side it reaffirms the philosophical centre of the show that war is ultimately pointless, as the Doctor says “There should have been another way”. On the down side you quickly realise that all three stories are essentially the same, with the same ending. That said the sheer volume of material here, at around ten quid a disc, makes this amazingly good value for money and a welcome addition to the growing pantheon of Who titles.